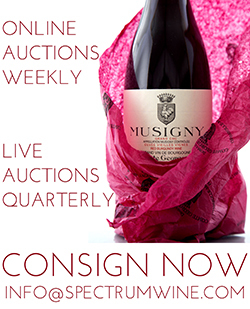 Spectrum Wine Auctions (SWA) conducts live auctions in both Los Angeles and Hong Kong in addition to weekly internet auctions utilizing its state-of-the-art website and bidding platform. Our firm offers the most competitive incentives and state-of-the-art technology for the benefit of our global consignors and buyers alike. We offer the rarest, greatest wines and spirits of the world as well as an impressive range of more modestly priced collectible and investment-grade wines. Backed by decades of auction expertise and driven by a team of dedicated fine and rare wine specialists, Spectrum Wine Auctions is committed to offering buyers and sellers alike the most accessible, expansive, and flexible auction services available for what is simply the world’s greatest consumable and collectible product. 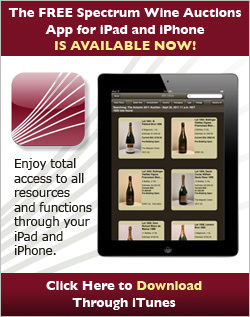 Spectrum Wine operates professional storage facilities in Irvine and Newport Beach. We also offer commerical pallet storage at our facility in Tustin. Read more about storage here. Spectrum Wine operates retail storefronts in Tustin and Newport Beach. View our inventory available for direct purchase. For customer service, shipment scheduling and information, provenance inquiries, photograph requests, or to schedule a lot viewing, email us at Info@SpectrumWine.com or call us a 949-748-4845.